Manufacturer of custom humidors, wine racks and cabinets uses new dust-collection technology to keep its shop running efficiently. Vigilant uses a vertically mounted cartridge system to keep its custom woodworking machinery and shop clean. A 10-year-old cyclone and baghouse dust collection system was creating headaches for Vigilant, Inc. of Dover, N.H., a leading manufacturer of finely crafted cigar humidors, wine racks and cellars, gun cabinets and custom cabinets. Problems included insufficient airflow through the system, time-consuming maintenance of bag filters, and the re-entry of nuisance dust into the building after bag cleanout, resulting in a dusty work environment. âAs we made plans to build a new facility more than triple the size of our existing plant, we knew we had to find a better way to deal with the dust,â said Vigilant president Charlie Griffiths. A high-efficiency cartridge dust-collection system, manufactured by Farr Air Pollution Control and designed by Ventilation Control Products, has eliminated baghouse maintenance problems and cleared the air in Vigilantâs new 40,000 sq. ft. facility. âWe planned to construct the new facility while continuing production at the old one, which gave us an opportunity to start from scratch with our dust collection,â Griffiths said. He turned for help to Ventilation Control Products, a manufacturers' representative organization that offers woodworking machinery designed for process ventilation and air pollution control in industrial and commercial applications. 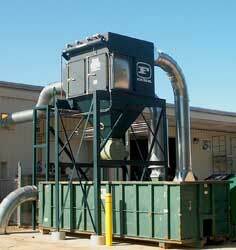 At first the company investigated dust collectors with horizontally-mounted cartridges, but VCP arranged for an on-site demonstration of a mobile Farr "Gold SeriesÂ®" dust collector, which uses cartridges that are vertically mounted. The system used at the new Vigilant facility contains 16 filter cartridges which handle the 10,000 CFM air volume required for the expanded production area. During operation, dust generated by a variety of equipment is sucked out of the work area and exhausted to the dust collector, which is located just outside the plant. The collector is mounted on support legs that straddle a covered dumpster, where dust collects as it falls from the cartridges and overbags during cleaning cycles. The cleaned air is then re-circulated back into the workplace, allowing savings in heating costs during the long and cold New Hampshire winters. Since the system is designed to re-circulate air, VCP equipped it with an explosion vent and spark detection and suppression system with an automatic abort gate for explosion prevention, as stipulated under the Standard for the Prevention of Fires and Explosions in Wood Processing and Woodworking Facilities 664. They also used automatic sprinkler heads to satisfy insurance requirements. âFirst and foremost, we like the way it cleans the air,â Griffiths said. "Productivity is another area where we have seen improvement. In the old facility, we were frequently pulling people off other jobs to deal with dust disposal, constant clean-up of the work area, and similar tasks."